Invest in a lifetime of learning. In an instant gratification world of Snapchat streaks, Facebook likes and participation medals, Greensboro Day School’s joyful, caring and trustworthy learning community stands apart. Yes, we have a dynamic, comprehensive and challenging academic program with unsurpassed facilities, but our real secret is in the interpersonal, ethical and intellectual foundations we lay for your child’s future success. For most children, future success is not rooted in the Quadratic Formula, memorizing the date of the Battle of Bull Run or the Periodic table, but how you manage time, relationships, and yourself. Success is not measured by where you attend college, it’s measured on how well you engage and contribute in teams, how you manage your digital citizenship, your empathy and service to others, and your respect towards those you meet along the way. 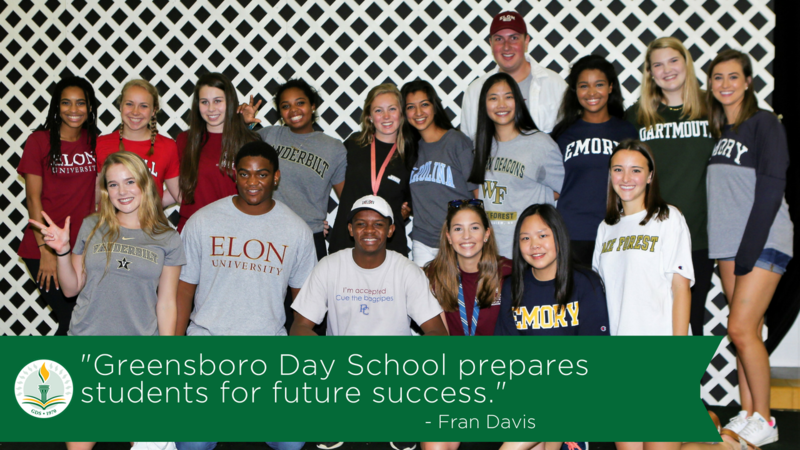 This preparation and foundation are why GDS is an educational leader in the Triad and why for nearly 50 years families have invested in their children and Greensboro Day School. "I chose, 10 years ago, and continue to choose Greensboro Day School for my girls (4th and 9th graders) first and foremost because GDS teaches them to be solid people as well as solid scholars. It prepares them not only for college, but for life outside of college. They are nurtured, challenged, supported and encouraged daily to be better than the day before. What more could I ask for?" Holly Jones, parent of Morgan '20 and Madi '25. No family at Greensboro Day School pays the full cost of a GDS education. Grants, donors and fundraising efforts limit the parent commitment to a maximum of 90% of the full cost of a GDS education. Last year, 28% of GDS families received a need-based financial aid award to offset tuition. Over 2.3 million dollars were distributed to GDS families in financial aid. Though a number of families at Greensboro Day School can afford the full tuition rate, a significant number of families could not be at Greensboro Day School without substantial financial assistance. If you believe your family would need financial assistance to attend Greensboro Day School we encourage you to contact Vivian Wilder to discuss your individual situation. We welcome the opportunity to share with you how we can make this outstanding opportunity for your child available to you. Parents are billed the full year's tuition, due in August, and may elect payment schedules of 1, 2, 9 or 12 installments. The 2-, 9-, and 12-month installment plans include an additional service charge. Purchase of tuition refund insurance and student accident insurance is optional. Please contact the Business Office for more information. Following is a list of tuition plus service charges associated with the payment plans the School offers. The service charges are added to tuition and billed according to the payment plan chosen. Both the 9-month and 12-month plans require auto debit. If you choose either of these plans, banking information will be required when completing the online enrollment contract. Suzuki lessons $450. Outside instrument rental prices vary. ﻿Please note that all additional expenses are estimates and differ according to grade and student needs/interests. Additional child(ren) receives a 20% discount on transportation fees. Third + child will ride free of charge. Daily rates for non-regular riders: Both Ways: $20; One Way: $15 for all routes, except Burlington. Thank you for considering a Greensboro Day School education for your family. We are committed to making an exceptional education affordable to families from a wide economic range. Enrolling talented and bright children who bring a variety of experiences and backgrounds is essential to our guiding principal of providing our students a socially and economically diverse community. Research has proven that for every $1 invested in a child’s education during their PK-12 years, the average return on investment is $8. Please do not assume that GDS is beyond your reach. From need-based assistance to payment plans, there are several options for you to fit Greensboro Day School into your budget. Currently, 27% of our families receive financial assistance. We are eager to work with you and find a plan that works best for your family. To learn more about Financial Assistance at Greensboro Day School, please click HERE.